"After taking 1 pill a day for a little more than one month I see a reduction of abdominal fat and an increased regularity. No undesired side effects of any sort. " Looking for a probiotic that will help you stay in excellent shape? There is one! Gasseri is a unique kind of probiotic whose function distinguishes it from all other strains. Similar to many probiotics, Lactobacillus Gasseri is a lactic acid-producing bacterium, which improves the function and health of the gastrointestinal tract, since lactic acid acts as a kind of natural protection to the gastric mucosa. But the positive properties of this natural microscopic assistant go far beyond the scope of normal digestive support. Many people are already certain of the fact that it is a valuable addition to weight control, which makes it an excellent supplement to any and all exercise programs. 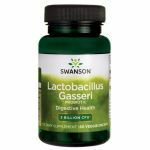 Lactobacillus Gasseri is also known as "the fitness probiotic" because it helps the body regulate levels of leptin, a hormone that plays a key role in energy metabolism and accumulation of fat. Leptin is often called the "satiety hormone" because it controls the sensations of hunger and fullness, reduces appetite and simultaneously improves metabolism. The organism’s leptin levels usually decrease when a person is subjected to a weight loss diet, which in turn slows the metabolism of the body as a natural reaction against unnecessary energy loss. This is one reason why many dieters are striving to conserve in the long term the reserves they have accumulated from fitness. Swanson Probiotics Lactobacillus Gasseri contains 3 billion viable organisms. The special vegetarian DRcaps® are acid-resistant and ensure the release of the ingredient directly into the gastrointestinal tract, which is a prerequisite for optimal and excellent performance. Other ingredients: Microcrystalline cellulose (plant fiber), hypromellose (vegetable capsule), silica, magnesium stearate. Suggested Use: As a dietary supplement, take one veggie capsule one to two times per day with food and water. Hello! I need this product. When can I buy it? Now is out of stock.Thank you!